In the first of a series of blogs for Run in the Dark, yoga, meditation and mindfulness teacher Lee Tracey talks through 6 yoga poses to complement and enhance your running training… and they can all be done on your living room floor! Imagine as you read this you are out pounding the pavement or perhaps jogging along the beach, running the canal (my usual) or doing laps of the local park. Imagine feeling the fresh air on your face, being mindful of being outside in the natural environment instead of just seeing it from a car or office window and feeling your heartbeat, your blood flow and your breath moving in and out of your body allowing the tensions of the day to fade into the background as you pay attention to the present moment. Not so different from the foundations of yoga, right? Being in the now, paying attention to how you feel, challenging your body and your mind and beneath all that, the foundation of feeling good and feeding into your own wellbeing. Sometimes, we get so caught up in one discipline or another that we forget that there are essential elements to all that are fundamentally the same. Good for the body, a release for the mind, a connection to the soul. Whether that happens for you on the mat or on the running trail, it makes no difference. I would not consider myself a natural runner. I don’t have long legs or an easy gait, nor that bounce that some runners just have naturally. I do however know the benefits of running and so have a few running sessions built into my regular fitness regime. I also know the physical impact that running can have on your body which is why it can be useful to build a good yoga or stretching routine into your weekly training sessions. Not only can yoga help improve your times, your stamina and your resilience but it can also prevent injury, bring awareness to any potential issues and create some much-needed rest and restoration for your wonderful body. So how can we enhance the experience of running while taking care of our bodies? First, let’s look at the physical aspects. Due to the high level of repetitive movement and force on the legs, runners often experience tightness or aggravation in the hamstrings, hips, and calves. Sometimes even the ankle and the feet. 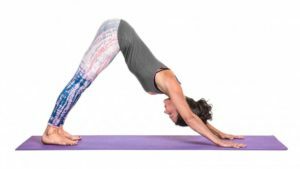 For the hamstrings try downward facing dog with hands and feet on the earth and your hips high to the sky in an inverted V shape. Here you can peddle out your heels and feel the stretch at the back of your legs. Try not to round at the upper back by bending your knees and rolling your shoulders back away from your ears. Stay in down dog for about 10 breaths. For your hips, Lizard pose can be really effective. From down dog (that inverted V position) step your right foot to the outside of your right hand. You can drop your back knee here or keep it lifted depending on where you are in your practice and your sensitivity in the knee. Keeping your chest forward and collar bones broad, feel the stretch in your hip. If you find you can go a little further, then you can play around with coming down onto your forearms to make this stretch more intense. Stay for 10 breaths and then swap sides. Pigeon pose can also work wonders here. From down dog, bring your right shin towards the front on your mat aiming for in between your arms. With your pelvis on the ground, make sure your back leg is in line; your ankle, knee and hip and then square your hips as much as possible to the front of your mat. You can stay upright here, lengthening the tail bone and drawing the navel in or you can lay down over the front shin making the stretch more intense by adding weight over the front leg. You can also move the front foot away from the body more to intensify the stretch or move the foot towards the groin to decrease the intensity. Stay for 10 – 20 breaths. This is a deep hip opener, so you may find that focusing on your breath will be helpful here. If you have issues with your knees or if this is too strong, try this alternative – lie on your back and put one shin over the opposite thigh and draw the legs in toward the chest to feel the stretch. For tight IT bands, try this wide stance forward fold variation with one leg crossed over the other. Step your feet 2–3 feet apart and hinge forward until your hands touch the ground, keeping a neutral spine. If you have trouble touching the floor, place your hands on a block or a chair. Walk your hands to the right, allowing your whole body to revolve so your feet and head face away from their starting points. Stop when your hips and thighs reach their max rotation. Your right leg will be in front of your left. Hold for 5–10 breaths, then repeat on the other side. For your lower back, finish with Bridge Pose and a simple Supine Twist to relieve any tension in the back and open the front of the body, which can become hunched over when running. Lying on your back, place your feet on the floor with your knees pointing up towards the sky, arms alongside your body with palms pressing down into the earth. Lengthen your tailbone bringing your pubic bone towards your navel and press into your feet and arms into the ground and begin to lift your pelvis and spine up towards the ceiling. Stay here for 5 – 10 breaths and repeat 3 times. Then simply allow your knees to fall to the right, turning your head to the left into a supine twist. Stay here for 5 – 10 breaths and repeat on the other side. You should feel restored, refreshed and stretched after these simple poses, making sure that your training regime is effective, safe and has longevity so you can keep doing what you love to do. Lee Tracey is a yoga, meditation and mindfulness teacher based in Dublin. She is interested in sharing practices that serve in helping people to live more fulfilling, mindful and vibrant lives. She works with studios and corporates in Ireland as well as sharing her passion at festivals and events throughout Europe and is a Lululemon ambassador. She has trained worldwide, from Dublin to Costa Rica to New York City and she has been lucky enough to learn from some of very best in their field. Her goal is to share what she has learned in an accessible and engaging way through movement, community initiatives, connection and awareness. A keen runner, Lee will be blogging for Run in the Dark about yoga, wellness and motivation.